If you have been injured in an accident involving a rental truck in Pennsylvania or New Jersey, contact us today for a free and confidential consultation. If we are needed and retained, we will hold every possible party accountable for your injuries. Can you sue a rental truck company for injuries? The summer time is the busiest time of the year for people to move and rent trucks. In fact according to MyMovingReviews, almost 40% of all moves take place in June, July or August. New Jersey ranked 4th for the most people who move locally within their own state. So everyone is seeing more and more moving rental trucks. In Philadelphia, we have many rental companies such as U-Haul, Ryder, Enterprise, Penske & Budget. How safe are these trucks being driven by often inexperienced drivers? Are they properly maintained and inspected? If you are involved in a truck accident or a car accident involving a rental truck causing the accident in Philadelphia or New Jersey, can you sue the rental truck company? According to Edith Pearce, a top personal injury lawyer located in Philadelphia and New Jersey, a rental truck company can be held liable for the accident in some circumstances. If the rental car or truck company rents a truck to a person who they know or should know is incompetent to operate the truck or vehicle, you may have a right to sue them under a theory of negligent entrustment. 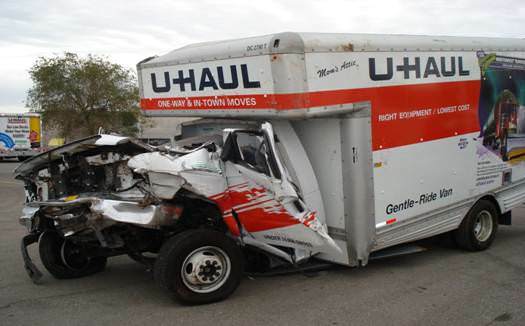 Also, rental truck companies such as U-Haul, Penske, and Ryder can be liable if they have not maintained the truck, which then contributes to the accident. Below is a list of 5 ways a rental truck company may be held liable for a crash involving a rental truck causing personal injuries. 1) Renting the Truck to a Person Without a License. Under the Section 1574 of the Pennsylvania Motor Vehicle Responsibility Law, “No person shall authorize or permit a motor vehicle owned by him or under his control to be driven upon any highway by any person who is not authorized under this chapter or who is not licensed for the type or class of vehicle to be driven. 75 Pa.C.S.A. § 1574. Thus, if a rental truck company or car rental company rents out a vehicle to a person who does not have a license, they may well be liable for an accident if the rental vehicle caused the accident. 2) Renting the Truck to a Person Who Can Not Safely Drive the Truck Which Causes the Accident. Under both Pennsylvania and New Jersey law, a rental truck company could be liable for renting a vehicle to an “incompetent” or unfit driver. This theory is known as negligent entrustment. If the rental truck company knew or should have known that the rental driver could not operate the truck safely due to the driver’s age or inexperience, there may be a claim for negligent entrustment. The rental company may be liable if the rental truck company knew or should have known that the driver was drunk or intoxicated or nearly intoxicated or drunk at the time of the rental, If someone is renting a truck from one of the popular rental truck companies like Ryder, Penske, or U-Haul and they have alcohol on their breath, the rental truck company may be liable if the rental truck is involved in a drunk driving accident. Rental Truck companies are responsible to inspect and maintain their trucks and cars to keep them safe on the roads. There may be a lawsuit against the rental company if the rental truck has bald tires, failing brakes, or faulty gear shift, and this failure to maintain the truck contributes to the accident. A personal injury lawyer will know how to obtain the maintenance logs and compare them to the actual condition of the truck. Here at The Pearce Law Firm, we have years of experience handling complex personal injury cases. We will look into every potential cause of an accident, and many times will sue several parties in a lawsuit, including the driver, the rental truck company, the garage inspecting the rental trucks, and possibly even the manufacturer of the rental truck. These cases are complicated from an investigation standpoint. Also, many times there are several insurance policies involved to collect against, including the rental company’s insurance, the negligent driver’s personal insurance, and perhaps the injured victim’s own automobile policy. Call us today and we will immediately begin investigation your case in Philadelphia, the surrounding counties, and Southern New Jersey. We are here to help.